Graduate Community Fellows contribute to these and many other offices, programs, and initiatives throughout MIT. The Office of Graduate Education (OGE) is proud to be supporting 28 Graduate Community Fellows during the current academic year. Graduate Community Fellows are a cadre of graduate students who work on projects and assignments that enhance graduate community in unique ways. Each fellow reports to a staff member in the OGE or in a partner organization and focuses on a specific project. This year Fellows are working in 12 different offices, including the OGE. Fellows meet several times each semester to coordinate efforts, and to pool their observations and reflections. They have the opportunity to advise the OGE about the needs of the graduate student community, and serve as an important conduit for informing the OGE about the graduate student experience. This academic year we have fellows serving in several new positions: 70 Amherst Street residence programming and collaboration with the dorm government; the OGE Committed to Caring campaign; the DSLx Life Learning website content and communication team; and positions supporting programs and events delivered by the International Students Office and by the Institute Community and Equity Office. 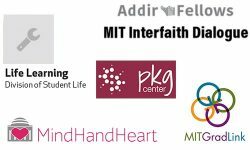 In addition to long-standing positions supporting the Addir MIT Interfaith Dialogue program and OGE programs for women, Graduate Community Fellows contribute to the work of GradLink and OGE programs for graduate student support; help to implement the Institute’s strategic plan for diversity and inclusion; promote graduate student financial literacy; develop the Language Conversation Exchange; support the work of MindHandHeart, Title IX and Bias Response, and Violence Prevention & Response; and connect graduate students with the Priscilla King Gray Public Service Center. Graduate Community Fellows play a key role in enhancing the MIT community, and we thank them!